Christie has entered a partnership with Canada’s Department of Foreign Affairs and International Trade’s (DFAIT) “Invest in Canada.” Christie has provided two digital displays featuring Christie MicroTiles and Christie Entero LED rear projection cubes at Canada Olympic House in Trafalgar Square. Operating from July 27 through August 12, in addition to being the Canadian Olympic Committee’s space for athletes, their friends and their families, Canada Olympic House hosts business leaders and government dignitaries and showcases Canada’s leading industries and businesses. 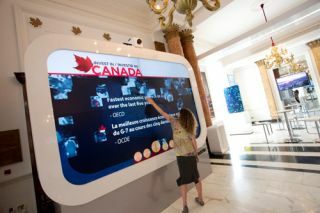 Christie’s partnership with DFAIT at Canada Olympic House in London includes a large lobby display of up to 37 Christie MicroTiles and four 72” diagonal Entero cubes, an LED-based ultra-high resolution projection display system, for the Business Club, site of numerous networking events throughout the month. Both displays show a video and graphical montage highlighting Canada’s leading sectors and landscapes. Float4 Interactive is providing the interactivity kit to allow multiple users to interact with the displays. Business leaders, government dignitaries, athletes and executives from all over the world are expected to attend the events to be presented at the facility. This includes an Information Communications Technology (ICT) day on August 6, put on by Invest in Canada in association with the Financial Times, as well as a technology showcase organized by Invest Ottawa on behalf of the Consider Canada Alliance. According to the government of Canada, Canada’s digital industries are a rapidly advancing sector, with 32,700 companies, more than half a million employees, annual revenues in excess of $162 billion and annual exports of $26 billion in 2010. Profiling these activities is part of the government’s economic strategy to create conditions for businesses in Canada to succeed on a global scale. At Canada Olympic House, senior policy-makers and global business leaders will inform potential investors about Canada’s ICT sector, its key areas of growth, as well as the challenges and emerging investment opportunities.